Today it is instantly recognisable but the Verner Panton Chair was unlike anything that had been seen before when it was initially designed in 1960. Its fluid, ergonomic shape is moulded from a continuous piece of plastic or fibreglass, and is a world first in furniture design. Aesthetic and practical, the Panton Chair pushed boundaries and set new standards to how a chair should look and function. Its flowing form is completely aligned to the human body, offering a surprisingly high degree of comfort. Stackable and easy to clean, the chair is ideal for any environment from thriving family homes to stylish offices.Our plastic Panton Chair has a matt finish and a textured surface. It is available in white, red, black, green and orange. Verner Panton was one of the most influential and experimental furniture designers in the 1960s and 70s. Unlike the majority of Scandinavian designers at the time, Panton was more interested in exploring new materials than making traditional wooden products. He was particularly fascinated by the opportunities that arose from the use of plastic. His Panton Chair was inspired by a desire to create a self-supporting chair, made from a single piece of plastic, that could be used anywhere. The unbroken ‘S’ curved Panton Chair was hailed as a triumph of design by critics and the public alike. In 1995, Kate Moss appeared draped over a Panton Chair on the cover of British Vogue. It has also consistently featured in the US TV series, Ugly Betty, and one of the earliest Panton Chairs is displayed at the MoMA in New York. Verner Panton was the first architect to work with form and design using plastic as his main material. When he created the Panton chair, the world’s first single-form, injection-moulded chair, it was considered a revolutionary technique back in the 1960s. Throughout his life Panton created innovative designs that combined materials in unconventional ways and was greatly influenced by the impact of colour on his work . 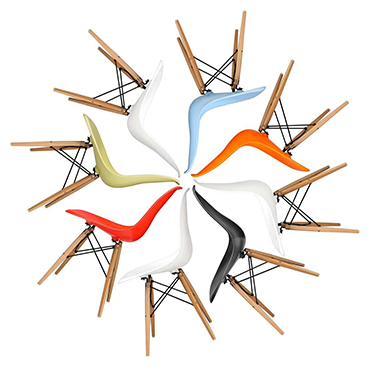 Verner Panton represents design without borders. Verner Panton’s vision: to create design using unconventional techniques. "Choosing colours should not be a gamble. It should be a conscious decision. Colours have a meaning and a function." Can only say I will know that shopping at Stin.